Residents of Northeast Montana September 5-7, 2018 had opportunities to learn about the future USS MONTANA, why she’s needed, and what she’ll be uniquely capable of doing to protect our nation. 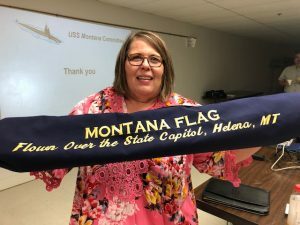 USSMTC Steering Group Member Bonnie Simon, Plentywood, with flag that had traveled around the state for later presentation to the commander of the future USS MONTANA on his first visit to Helena. Audiences heard about the growing military capabilities of potential adversaries in various parts of the world that drive the need for the submarine. Capabilities of the new Virginia Class subs that include MONTANA were discussed, as were the naming and training of the first crew members, some of whom are from Montana or have Montana family connections. At presentations sponsored by the Kiwanis Club and veterans’ groups in Glasgow, and in cooperation with the USS Montana Committee in Glasgow, Plentywood, and Scobey, audiences of all ages heard about the history and technology that underpin the future USS MONTANA. This Virginia Class nuclear-powered fast attack submarine is expected to be commissioned into the Navy fleet in late 2020. 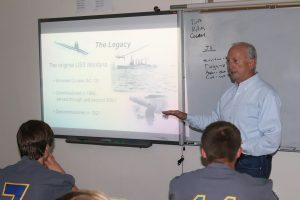 Scobey High School students hear about the history of the original USS MONTANA, an armored cruiser commissioned in 1908 from USS Montana Committee Chairman Bill Whitsitt. Photo courtesy of Daniels County Leader. port city of Vera Cruz. The USS Montana Committee is always ready to provide speakers to update audiences on the new submarine. Those interested should send a request to the Committee through the Contact page of the www.ussmontanacommittee.us website.